Eileen is passionate about the power of social movements to create change. She was first inspired to be a CAT Changemaker in 2001 when she downsized from London life and moved to rural Wales to work at CAT. Eileen has worked for charities and organisations campaigning on environmental, human rights and social justice issues for nearly 30 years, initially as a fundraiser for national charities including Amnesty International, Free Tibet Campaign and Save the Children. 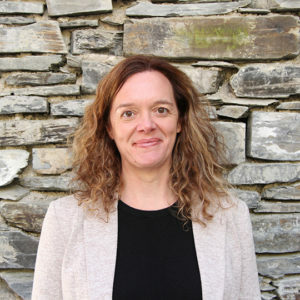 She moved to Mid Wales in 2001 to take up a post as Administrative Director at CAT (one of only two people to hold this post). She left to teach in the Department of Voluntary Sector Studies at the University of Wales Trinity Saint David, Lampeter. After having her daughter, she moved to work at the Wales Council for Voluntary Action (WCVA), where she provided training, advice and consultancy for charities in Wales. She was seconded for a year to the National Library of Wales where she held the position of Head of External Affairs. She has an undergraduate degree in psychology from Edinburgh University, an MBA from the University of Wales, Trinity Saint David and the International Advanced Diploma in Fundraising. Although Eileen left CAT in 2004, you can never really leave CAT and was delighted to return in 2018 as Head of Development. Outside of work she enjoys trail running, mountain biking, surfing, birdwatching (shh!) – in fact, anything that involves being outdoors enjoying Wales’ beautiful mountains and beaches.